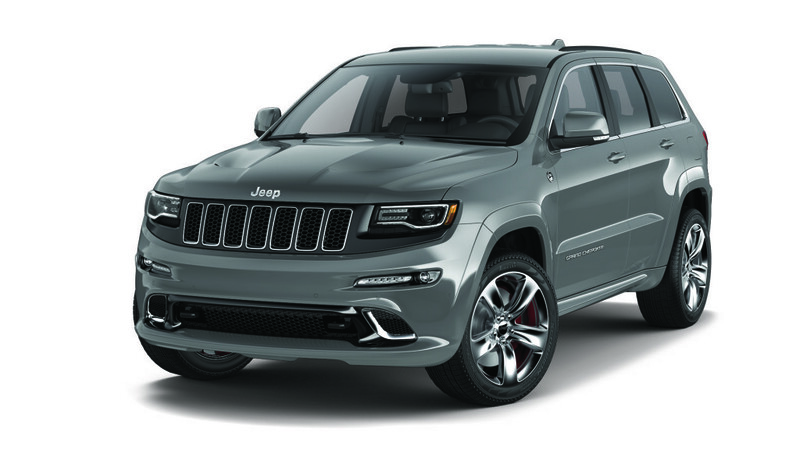 Jeep partnered up with SRT (Street and Racing Technology) back in 2014 to create a track-ready performance SUV, called the Jeep Grand Cherokee SRT. The Jeep Grand Cherokee SRT is a potent combination of horsepower, technology, and refinement making for an eye-catching SRT performance Jeep. Not only is this unique Jeep model powerful and refined, but muscular and luxurious too. A year after it’s conception and release, another Grand Cherokee SRT model, the SRT Night, took the stage. The Grand Cherokee SRT Night is nearly the same vehicle, yet it polishes up the SRT model with a smooth yet striking appearance. The Jeep Grand Cherokee SRT 4×4 has four key performance features: a HEMI engine, race-inspired interior, an SRT-exclusive exterior, and its Brembo brake system, the same used in the Dodge Challenger SRT variations. The Jeep Grand Cherokee SRT is no Dodge Challenger or Charger SRT Hellcat, but its 6.7-liter V8 HEMI engine delivers 475-horsepower and 470 lb-ft of torque. Power is transferred to the vehicle’s four wheels via the Grand Cherokee’s smooth shifting 8-speed automatic transmission. Together all of these components make it the best performing Jeep available and it accelerates from 0-60 mph in just 4.8 seconds, which is excellent for an SUV. The intelligent transmission software accounts for variables like engine torque gradients, kick-down events, longitudinal and lateral acceleration, grade changes, friction and downshift detection. Additional parameters include vehicle speed control, electronic stability control interaction and temperature. The result is automatic shifting that is ideally attuned to the performance requirements of almost any driving demand. For such a powerful vehicle, the Grand Cherokee SRT is surprisingly fuel efficient getting an average of 19 mpg on the highway, and much of that fuel economy can be attributed to the Grand Cherokee SRT’s innovative transmission. Additionally, the Grand Cherokee SRT’s transmission features an Eco mode that optimizes the transmission’s shift schedule and extends the range of the Fuel Saver Technology, which deactivates four cylinders when conditions allow. The Jeep Grand Cherokee SRT with an improved standard towing capacity of 7,400 pounds, which is 3,700 pounds more than the standard towing capacity on other Grand Cherokee models. Not to be confused with the Selec-Terrain System that is available on other Grand Cherokee models, the performance of the Grand Cherokee SRT is further accentuated by the Selec-Track system when the vehicle is in Track Mode. In Track Mode, 70 percent of the engine’s torque is delivered to the rear wheels for a more pronounced rear-wheel-drive experience that is typical of performance cars like the Dodge Challenger SRT and Dodge Viper. The Selec-Track system uses performance-tuned software to distinguish the five dynamic modes: Auto, Sport, Tow, Track, and Snow, enabling drivers to choose a vehicle setting that ideally meets their requirements and ambient conditions. The torque split change in Track mode makes the vehicle more responsive and delivers faster lap times when pushing the vehicle to its limits at the local track. With a lot of power under the hood, the Grand Cherokee SRT needs a brake system that is equally as powerful. The Grand Cherokee SRT is equipped with Brembo High-Performance Anti-Lock Brakes and Advanced Brake Assist. These special red brakes have vented rotors and the vehicle’s front brakes have six-piston calipers and the rear brakes have four-piston calipers. With its blacked out front grille, gloss black treatment, 20-inch “Goliath” polished aluminum wheels, and LED daytime running lights the Jeep Grand Cherokee SRT will surely turn heads. The Grand Cherokee SRT is available in eight different exterior colors including the bright red hue that is only available on the two Grand Cherokee SRT models. Buyers have the option of three different interior colors for the Grand Cherokee SRT’s premium Laguna leather interior- nothing speaks royalty like the world’s finest tanners, bringing leather that’s as soft as it is shiny. The SRT steering wheel is also wrapped in leather with a flat-bottom, featuring paddle shifters for manual gear changing, and the SRT button offers easy access to the Uconnect performance pages. In addition to providing drivers and passengers easy access to the entertainment options, the Uconnect system keeps drivers in-check with real-time stats on their vehicle’s performance at all times whenever they wish. Take into account its 19-speaker Harman Kardon sound system and seven-inch instrument cluster, and we’re just trimming the icing off the performance tech on this Jeep. 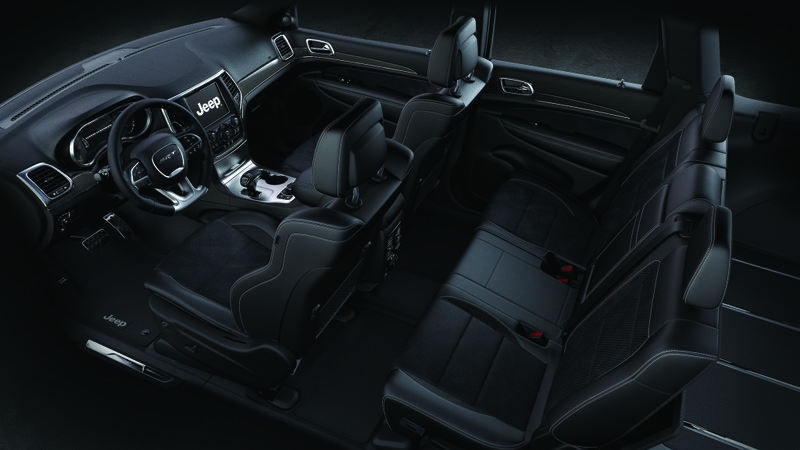 Introduced at the beginning of 2016, the Jeep Grand Cherokee SRT Night, is a special-edition appearance package. It features all of the same engine specs as the Grand Cherokee SRT, but it has enhanced interior and exterior elements that give it a more aggressive appearance . The roof, rear spoiler, front grille bezels, and side window are all painted Gloss Black; the “5Ten” 20-inch lightweight wheels have a Satin Black finish; the interior, also premium Laguna leather, is all black. Looking for a performance SUV? The Jeep Grand Cherokee SRT or SRT are excellent options. If you would like to test drive one, come by Aventura Chrysler Jeep Dodge Ram today, or check out our available inventory here.